GLENN Mulholland produced an explosive finale to put the icing on the cake of a fantastic night for Furness Catholic ABC. The big-hitting Mulholland stopped Wigton’s Dean Stalker in the first round at the 12th and final bout of Friday’s Dinner at the Ringside show. 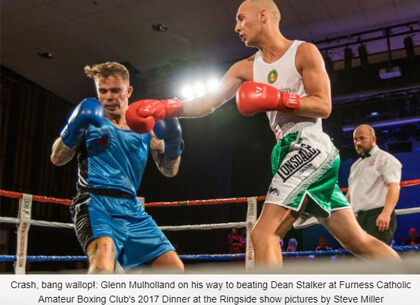 Mulholland’s KO victory made it an impressive four out of five successes for Team Ryan, with club mates Ryan Gilroy, Elliot Carvill and Morgan Hodgson also having their arm raised by referee Dave Tennison. Mulholland’s victory was the most emphatic of the Furness CABC wins as he forced two standing counts before sending Stalker sprawling into the ropes to end proceedings in style. Earlier, Gilroy showed why he has enjoyed several triumphs in the green and white colours, as he defeated Barnard Castle’s Nathan Forrest in a cracking contest, which won praise from the referee. Up against a fast and aggressive opponent, Gilroy remained calm and composed under fire, and boxed tidily throughout to earn a majority decision, announced to loud cheers by MC Ralph Spours. While Gilroy is no stranger to fighting at big shows, his stable mate Carvill is a newcomer to the ring, although you wouldn’t have thought so judging by this accomplished showing. Carvill looked solid in defence and stylish in attack in gaining a unanimous victory over Cleator Moor’s Carl Nicholson. After a patient start, Carvill steadily warmed to the task and by the third and final round he was well in control. The host club’s other victor was Morgan Hodgson, who came out on top against Dale Blaylock in a bruising battle, where fists flew from first bell to last. Hodgson showed good technique to keep the Wigton man at bay for the most part. And the Team Ryan boxer had enough joy going forward behind a solid jab to claim a unanimous decision. Rookie senior Tai Jacques was Furness CABC’s other representative in front of the sell-out Forum audience, and he was unlucky to come up against the dangerous Hamza Rana. Jacques showed a lot of heart and gave it all he had, but the fast and furious Premier ABC man took a unanimous verdict. Several other Cumbrians were in action on the night, and boxers also travelled from Merseyside, Manchester and the north east. Whitehaven south paw Paddy Hood came out on top against Craig Noon of Widnes ABC in a real tear-up which saw them trading blows from start to finish and both covered in blood by the end. Hood’s club mate Jacob Carton was involved in a very evenly-matched contest with Ben Henderson of Hartlepool Elite, the latter taking a majority verdict after gaining the upper hand in the third round. Ivan Kulbakov of Ambleside and Windermere ABC found it hard to get on top against the rangy Ryan Smith who used his reach advantage to put together some telling combinations and take a unanimous decision for Ancoats ABC. Cleator Moor ABC’s Arron Spencer found the going tough against Mustafa Azizi, with the Premier ABC fighter ending it in the second round thanks to a vicious left hook. Cleator Moor ABC’s Arron Spencer found the going tough against Mustafa Azizi, with the Premier ABC fighter ending it in the second round thanks to a vicious left hook. The other senior bout saw Widnes’s Harry Craig take a majority verdict win over Hamzah Shaffi of Fit2XL in an extremely difficult contest to call. The evening had begun with two hard-fought junior bouts. Jason Cummings of Hartlepool Elite made the long journey home to the north east a triumphant one by beating Carlisle’s Wilson Davidson, and Liam Gray of Gorton ABC got the nod against Keighley ABC’s Lewis Roberts after a gripping bout which could have gone either way. The appreciative audience were treated to some excellent boxing, and they also showed their generosity in raising a lot of money for a club which prides itself on providing free coaching for fighters of all ages and experience. An auction of sporting memorabilia hosted by Barrow Mayor, councillor Tony Callister, swelled the club coffers considerably to ensure one of Barrow’s longest running sporting institutions will continue to thrive.